International trade continues to expand robustly in East Asia and elsewhere, but global trade negotiations have collapsed and globalization is widely criticized. In this book, the participants of the thirtieth Pacific Trade and Development Conference—including the then-Director General of the World Trade Organization, and leading government officials, academics and executives from a dozen major Pacific Rim economies—debate whether global negotiations have ended once and for all, or are suffering temporarily from ‘globalization fatigue;’ whether East Asia’s new regional partnerships will advance or undermine the global trading system; and whether the region’s trade tensions with the United States will intensify or subside. They provide new empirical evidence on how trade affects the distribution of income, the location of pollution-intensive industries, the causes of ‘outsourcing,’ the structure of the intellectual property regime, and international security. And they probe the implications of adjustment to globalization: how can countries reap the benefits of trade while controlling the risks faced by the poor and, perhaps more importantly, the politically strong? 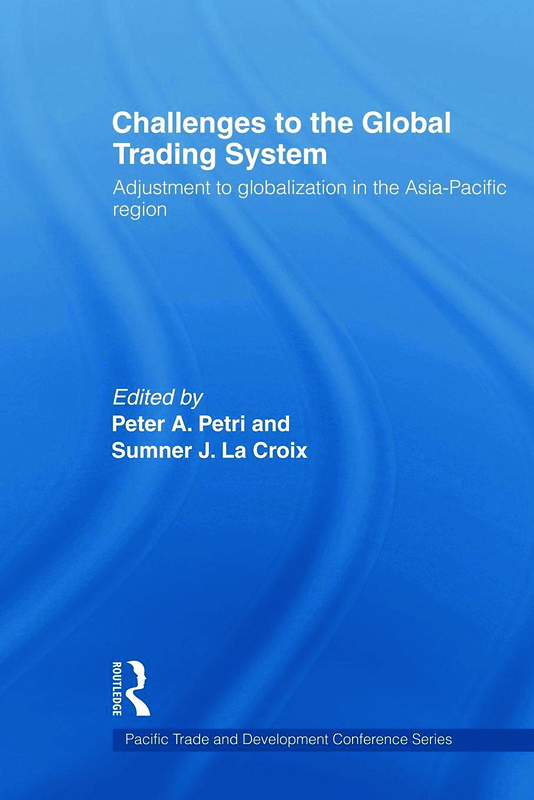 Challenges to the Global Trading System is an invaluable resource for students and scholars of Asia-Pacific studies, international relations and development studies, as well as those with a more general interest in Asian studies. Have developing countries gained from the marriage between trade agreements and intellectual property rights?